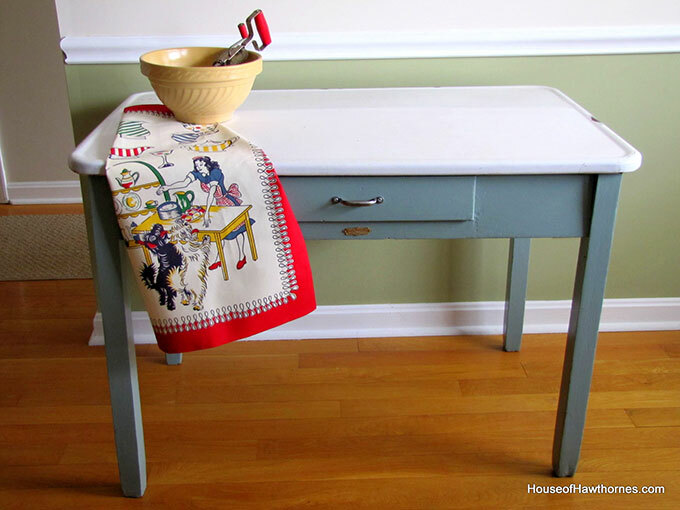 If you missed installment number one of Mr. Chippy you can read about me rescuing my mother’s vintage enamel topped table. He wasn’t being held hostage or anything, he had just been a little mistreated and neglected. He now resides happily at my house. and what he looks like now. I solved the excessive chippiness and rust problem by unscrewing the enamel top and turning it around 180 degrees. I know that doesn’t really solve the problem, but it is a heck of a lot less noticeable now, since I can put the bad spot against a wall. Using soap and water and spray cleaners really didn’t even TOUCH the embedded black stuff on the top, so I brought out my trusty Bar Keepers Friend and it got the majority of the 100 years of dirt off of it. If you’ve never used it, Bar Keepers Friend is like Comet Cleanser except not gritty and it doesn’t scratch. I originally bought it to keep my fancy cookware looking shiny, but I am finding more and more places to use it. 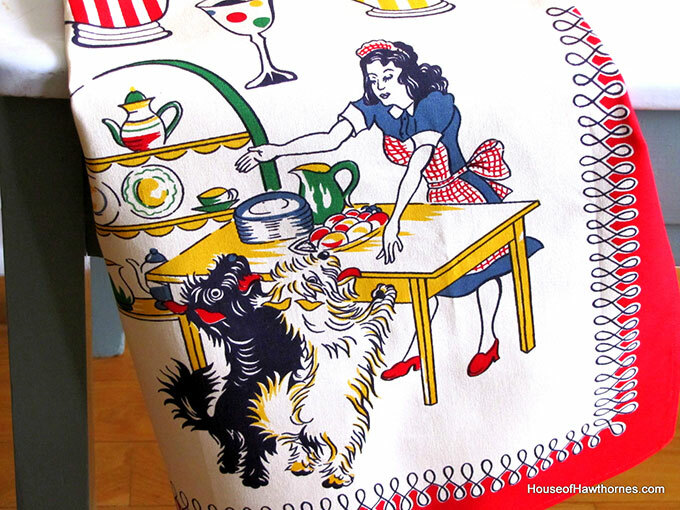 This is one of my favorite kitchen towels, although I never actually use it for dishes. Don’t we all have just-for-look towels? 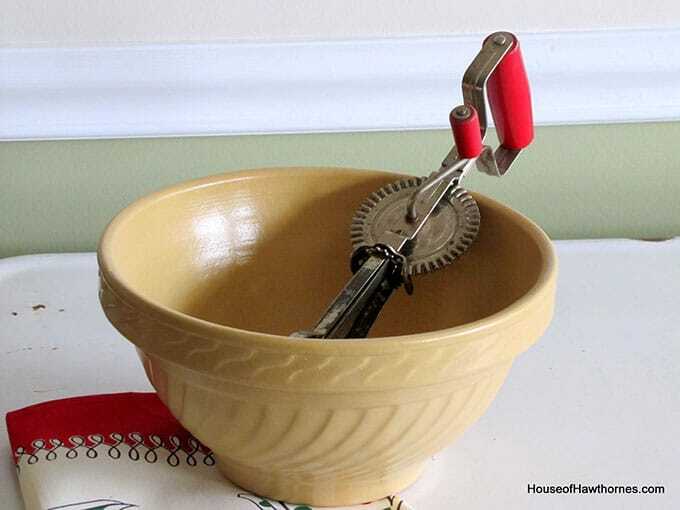 One of my favorite mixing bowls with my vintage egg beater. You didn’t think I was actually mixing something up in here, did you? Nope, just for looks. I cleaned the paint off the original handle with a wire brush on my husband’s bench grinder. It’s that machine with all the stiff twirling metal wires that looks like it could take your fingers off if you slipped. And the paint sort of fell off the label while I was taking it off the table. Sort of like. magic. Then I just polished it up with the Bar Keepers Friend. The color used was Benjamin Moore’s Azores, but mixed at Home Depot in their semi-gloss Behr paint. I have nothing against Benjamin Moore paint, I just happened to be at Home Depot that day. Some of my photos make it look a little like 1980’s country blue, but it is actually a turquoise/blue/green/gray color. One more look at Mr. Chippy’s before and after. Hopefully he’ll last another few decades. Pam- what a wonderful transformation! You did a great job on saving this old girl. Love turning the top around. Love your yellow bowl…my favorite color! Wow, Pam! I am so impressed with the table!!! The difference from before to after is amazing!!! Love the kitchen towel, too…It’s not just you, I have “just for company” towels, too!!! I just love Bar Keepers Friend, that stuff is amazing. I used it at my cabin to get the rusty water stains out of the tub…worked like a charm. Brilliant! At first I was like…whoa..did she re-enamel that baby?! How clever to just turn the top around! 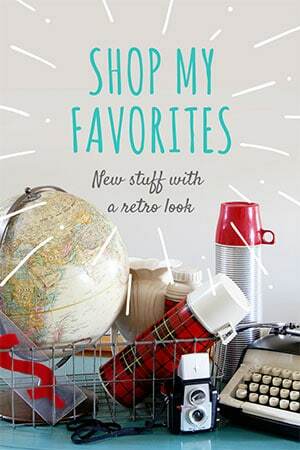 I am loving all of it, especially that towel with the begging pups… and of course you are not alone with the for-show-only towels, I couldn’t bare to wash the color out of some of those vintage treasures… and they look great when I am propping a vintage set or cookbook! Oh, Pam, you are so smart and talented! That was such a great idea to rotate the top! I also love the color you chose. 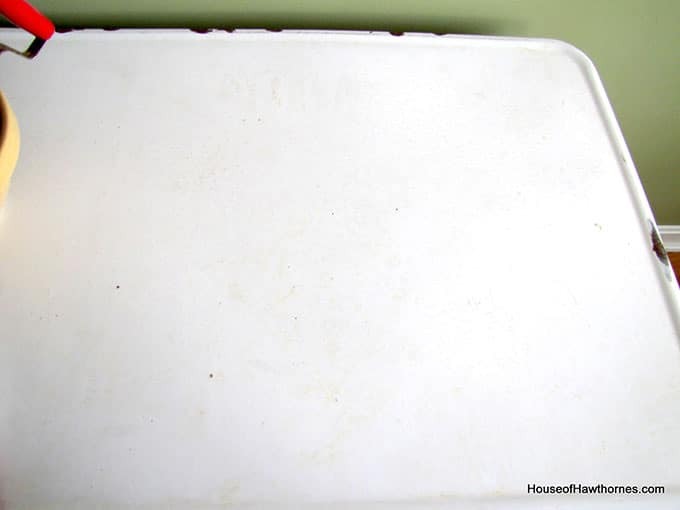 Wow, what a difference…I swear Bar Keepers Friend can clean anything. Your table really looks great now. Wow, it looks new!! WOnderful job! Wow! It looks wonderful! What a difference! You did a fantastic job! LOVE your table! I like the signs of age spots. and it’s a PERFECT color! 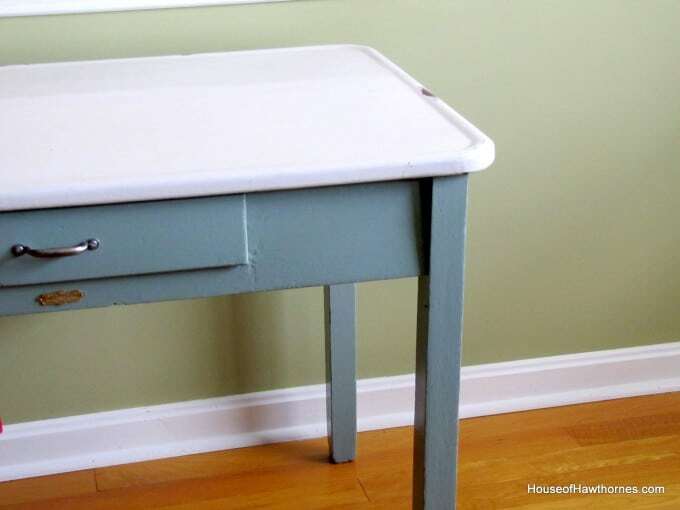 Magic Erasers work good too… I LOVE this size table and they are ALWAYS following me home! I can never seem to have enough little tables…Hmmmm, maybe it’s a place for all the dishes that follow me home! This looks super and what I like is that you retained just enought of the old patina to keep it interesting. You were very cleaver to think of turning it around. (-: Such a nice piece. What a lovely, nostalgic addition to your kitchen. Great job. Beautiful! I have one similar to this sitting in my garage waiting for some TLC. However, mine has been painted white on top, but quite chipped paint. From what I can tell so far the porcelain top is not chipped. Hope I find that so after complete paint removal. I love the table…great job on it and that color is perfect! I use Bar Keepers Friend a lot. One of my favorite uses is to fill my stainless steel sinks with hot water and Clorox, let them sit for a while and then clean them with BKF. Boy do they shine. It looks like a completely different table, Pam. I like it! I love what you did with the table. the paint looks great, right down to the little label sno white! Great little kitchen towel too. All I can say is WOW!!!! It looks new. I love the color you selected. I’m sure, it makes you feel good inside. Job well done my Friend! Ditto Liz’s Wow! Love the color. Turning the top solved a lot of problems alone. Great job! I love enamel topped tables. 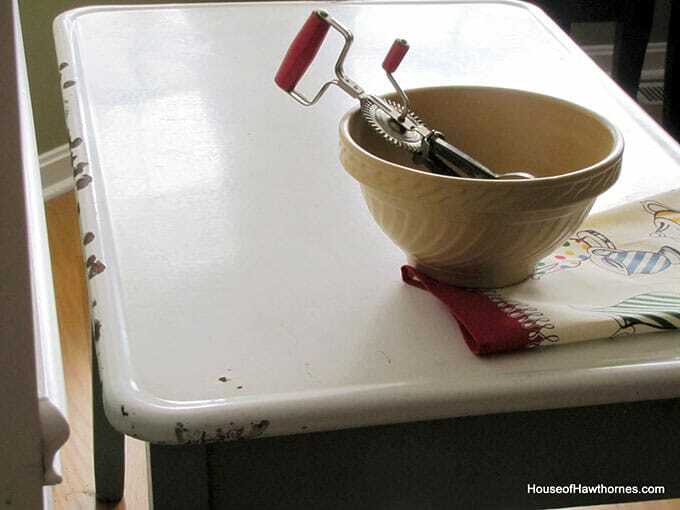 Our kitchen table is a vintage enamel top with a red design on the white. I’ve seen them cut down for coffee tables, too, which would be cool in a family room. Great that yours has the label. It’s a beauty, so are your vintage accessories. Wow, that table turned out so great, Pam! You did a great job on it, and it looks wonderful with your accessories! great job! i never would have thought to turn the top around! that color is BEAUTIFUL! Pam, great job on that table! I’ll bet you could even try painting the rust spots with enamel paint to stop the rust from creeping. Brilliant idea to rotate the top! I love Barkeepers Friend, I use it all the time! If you happen to be in Williams Sonoma they have the giant economy size! My market doesn’t carry that! I hope your husband liked the lobster mac & cheese! So nice of you to come back and tell me you made, I really appreciate that. Hi Pam – I love your table! I have been getting more and more into the farmhouse style and your table would fit right in, no to mention that it’s blue – perfect! I use barkeepers friend also – it does work on many stubborn problems and it’s inexpensive to boot! 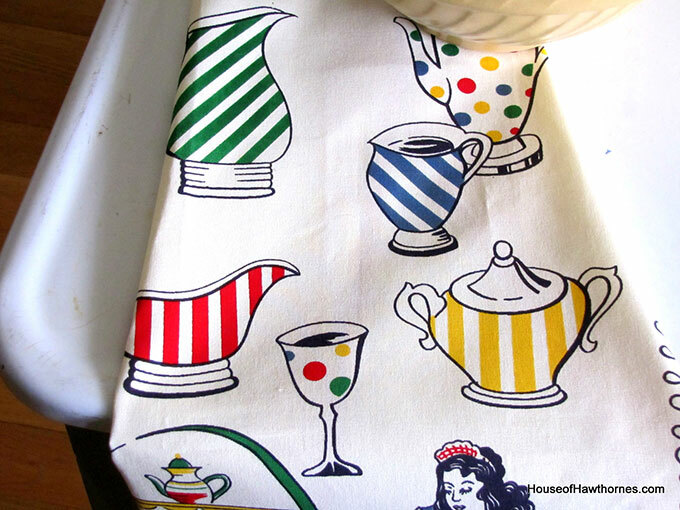 And don’t be silly – of course I don’t actually USE my favorite dishtowels. : ) I love to decorate with them! I really love your ‘new’ table! What a clever idea to turn the top around too. The tea towel is so cute. I’ve never heard of that cleaner before but maybe it’s not available in Canada. Great job! It turned out wonderful! Love the color! And who cares as long as you can’t see it. We all do that, don’t we? Pam that is beautiful! You did an amazing job cleaning it up and giving it new life! I love the color! The color for the legs is perfect too of course. I just love it. Now if only you could clone it and then sell me one – now that would be the perfect situation. Sorry for the long post, and I promise not to stalk your table anymore but I just had to attemp to let you know how fabulous I thought your it is. Have a great night Pam! Mr. Chippy looks so much nicer with his new coat on. 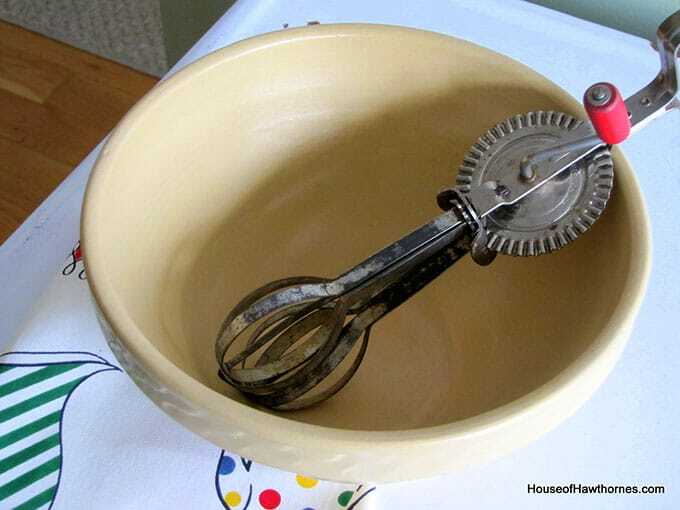 We use bar keepers friend to clean our vintage farm sink and it works wonders. Have a wonderful weekend. I own a resale shop and came across your post. 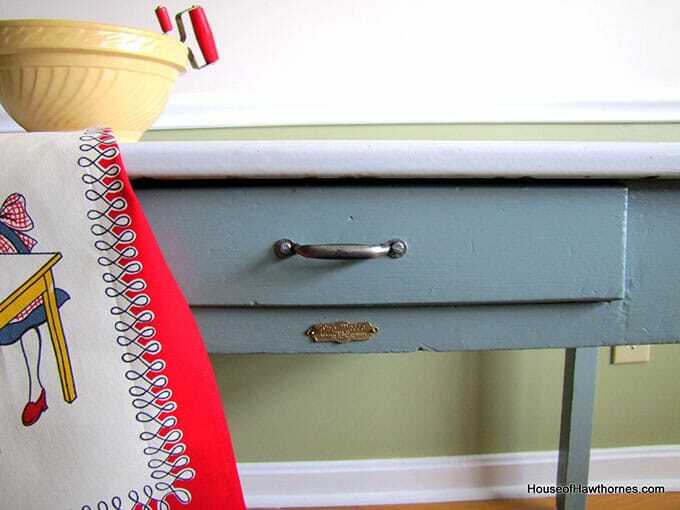 I have two enameled top tables and appreciate your sharing your success on refinishing. The table looks great! I’m off to see if I can get my two tables to look as good as yours. Love the transformation! The towel is perfect for show on your table! I have 2 of these tables. One sits in my garden shed (it’s in great condition) and I just bought another one that someone made a little fancier and plan to make it into a potting shed this summer. I really like your blog and am now followingn along. I’ve always loved my aunt and my mom’s vintage things while growing up and am now slowiing collecting. I’ve always loved a good garage sale. So excited to see this table. When we bought our first house in 1979 the old owners left a table just like this behind. I used it in the basement for laundry. When we built a new house 3 years ago I insisted on bringing with me. (Boy am I glad! )My son who thought I was nuts to bring it with me just told me for my Christmas gift he was going to restore it for me!Can’t wait to see how it turns out!! 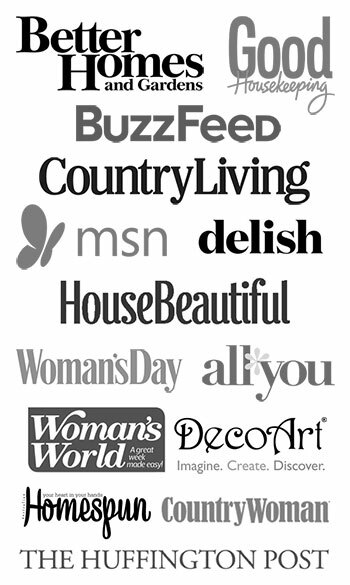 I just bought a table and the top was very bad, so I googled how to clean enamel and found your blog. Thank you so much, now my table top looks 100% better. HOLY COW!! I just restored this SAME table…it must be the great minds theory because your table looks amazing! 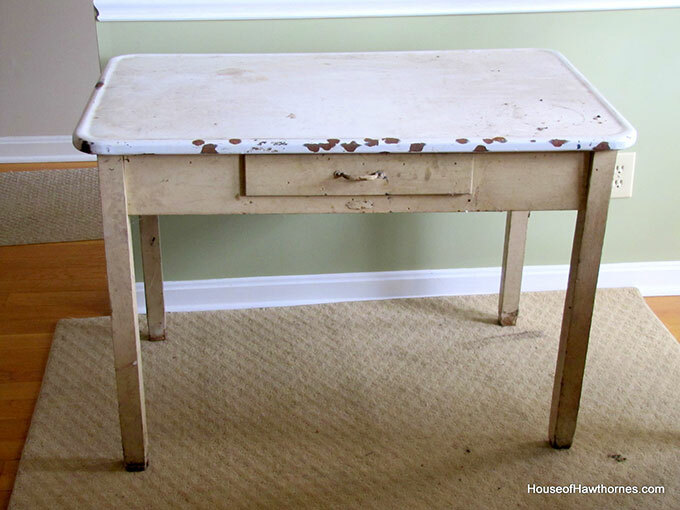 I use one of these as sort of a desk and have been staring at it for years wondering how to restore it. You gave me some GREAT ideas. Thanks! Very pretty! You did good job on it! We had this table when I was a child (I’m 68 now) and when my mother passed away I moved this table to my new place. It had been in the basement for years. When I was having repairs done on my home the workers used it to set things on under the carport but decided to “protect” it they put a rubber backed rug on top of it. After all was said and done it got wet and dried over and over. Now there is the backing stuck to the top of it and I can’t get it off. I was going to take it to car painting shop to have them fill a large chipped area (about 3″) and then sand and spray it. Need to refinish but I don’t know if that is the place to have it done. Any recommendations for a better place? What a brilliant idea to turn the top around. The table looks terrific! You have a Sno White table. 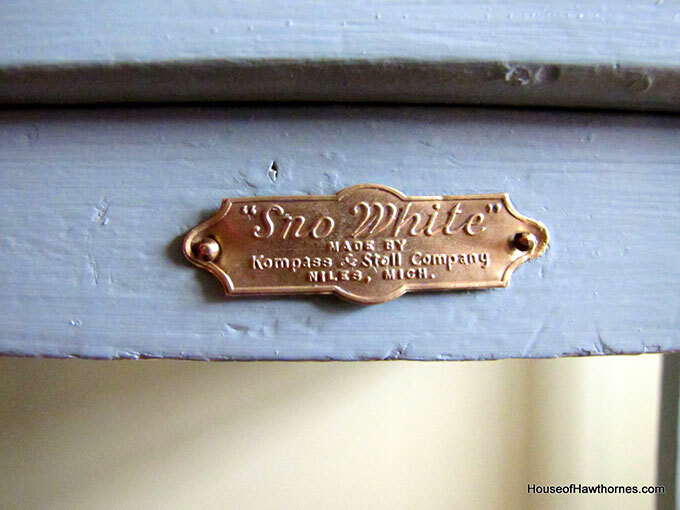 Sno White tables were produced between around 1900 – 1908. It is actually worth more before refinishing it, even though I love the new look. I also have a Sno White table, found along the side of the road! I have debated about painting ours. 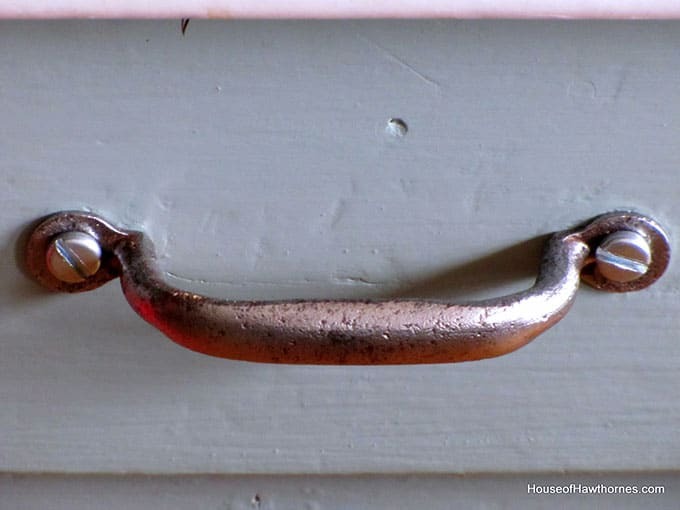 The enamel on ours is in very good condition, the paint just a little flaky. Next time you want to take paint off old metal just boil it in white vinegar. It will fall right off. A lot less work and destruction of the old metal. Thank u for clarifying cleaning the enamel..I just refinished a table identical to yours and need to embark on the top now. I just got one of those tables out of my mother’s basement that had been there for 50 years! Thank you for the idea, I’m gonna redo it soon! !